Dr. Ashok Kumar Omar is an astute Cardiologist associated with the Fortis Escorts Heart Institute & Research Center since its inception. A Director of the Cardiology Department, he has a special interest in Non-Invasive Cardiology, 3D Echocardiography, 3D Transesophageal Echocardiography, Advanced Echocardiography, and Valvular Heart Disease. With degrees of MBBS from the GSVM Medical College, Kanpur, and MD from the same college, he received training in Cardiology at the National Heart Institute under Dr. S. Padmavati. 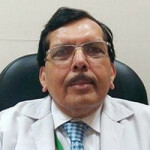 Academically accomplished, he was awarded the fellowships of the American Society of Echocardiography, European Society of Cardiology, Cardiological Society of India, Indian Academy of Echocardiography, Indian College of Cardiology, and the Asia-Pacific Society of Cardiology.